Irony is not something typically associated with golf communities, but River Landing in Wallace, NC, may take the title. A community conceived and developed by one of the largest hog farming businesses in America will benefit by a state legislature earmark that will help control an under-capacity sewage system in River Landing. The lack of a large and more efficient system has prevented the Murphy family, founders and owners of the community, from enlarging its on-site Holiday Inn Express Hotel and developing the remaining 1,000-plus lots inside the gates. Depending on what side of the issue local North Carolinians find themselves, the $860,000 River Landing will receive from the state is either a boon to the local economy or a special favor from one legislator to a former powerbroker in the North Carolina state legislature, River Landing principal Wendell Murphy. Whatever, River Landing’s 400 property owners have started the new year in a happy place. Homes for sale in River Landing start in the mid $200s. After a few visits to River Landing over the last decade, a few rounds on its two Clyde Johnston golf courses and a fine dinner in its beautiful and large clubhouse, I can recommend the community as a great buy and a convivial place to retire. (For the record, I smelled nothing amiss during those visits and, according to reports, River Landing and Wallace town workers have been mostly successful in keeping the sewage problem under control.) During that dinner in the clubhouse years ago, my waiter excused the slow service -– I hadn’t noticed it -– as a result of the Murphy family patriarch holding a meeting in an adjacent room where he was enlisting local doctors to fly on the Murphy family airplane to Haiti to help with earthquake relief. Maybe I am an idealist, but developers who care about people thousands of miles away probably take pretty good care of their residents at home. 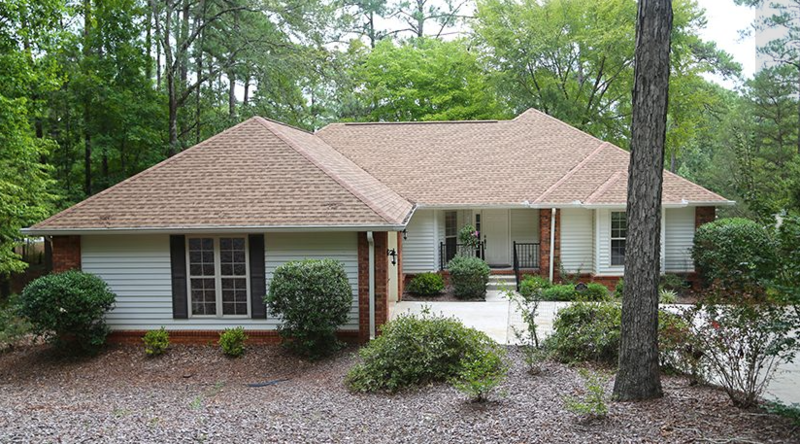 A couple looking for a golf community with River Landing’s combination of assets might want to make a visit soon. The odor of negativity about the sewage issue, which so far has been kept under control, has tamped down selling prices. But once an upgraded motor at the local plant and additional sewer lines are installed, things should start smelling like roses for home and lot sales at River Landing. To read more about the sewage issue, please see the article at The News & Observer. Rounds of golf played last year on Myrtle Beach’s nearly 100 courses were up year to year for the first time in more than a decade. Even before the Great Recession, rounds began to drop in 2005, the result of irrational exuberance about the golf market on the South Carolina coast and the resultant overbuilding. In recent years, the number of courses on the Grand Strand, as the strip between Wilmington, NC, and Georgetown, SC, is commonly known, has dropped by about 20%. 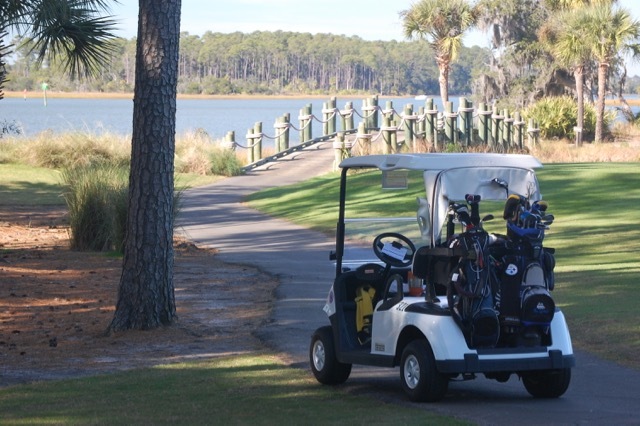 According to the Myrtle Beach Sun Times, a study conducted by Golf Tourism Solutions, a technology and marketing group hired by the local golf industry, determined that total rounds increased 4.1% year over year. The firm used about 80 of the area’s courses to compare rounds year to year. The positive golf numbers were reflected in incoming passengers through Myrtle Beach’s International Airport (a couple of flights from Canada make it “international”) and hotel and condo occupancy rates. The Jack Nicklaus designed Pawleys Plantation is one of the 30 golf courses in the Myrtle Beach area owned by Chinese firms. Pictured is the 11th green. The uptick in golf tourism appears to be propping up real estate sales. The Coastal Carolinas Association of Realtors has not produced end of 2017 results yet, but as of the end of November, sales volume was up 9.2% for the year, and condo sales were up 16.3%. For those seeking to build a home, or to invest in lots for appreciation, unimproved property sales were up 8.3% through November. Of greater importance to those considering Myrtle Beach for a vacation or permanent home, median sales prices in the area were up 3.9% year to date at the end of November, although November prices slid 2.4% when compared with November of 2016. Those of us, including your author, who own property next to the 30 or so golf courses owned and managed by Chinese companies, are especially buoyed by the latest results. Ongoing reports about financial troubles back home in China have created ongoing rumors that these owners might walk away from their investments and put the future of the golf courses as golf courses in jeopardy. 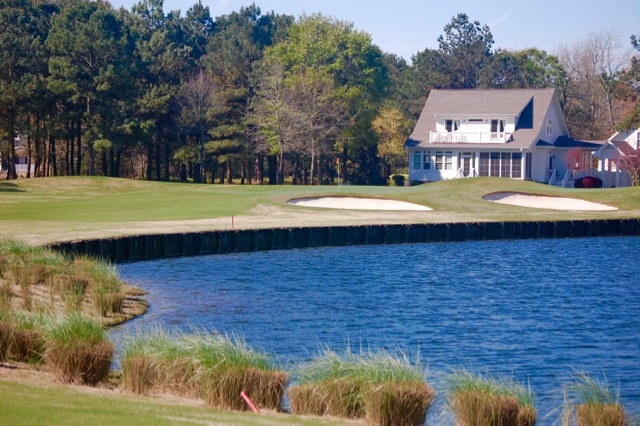 In golf markets that are not doing as well as Myrtle Beach, golf course owners, residents of adjacent properties and local zoning boards are battling over whether it is permissible to build homes on failing – sometimes abandoned -- golf courses. Regardless of the outcomes of these fights, real estate values suffer, certainly in the short term. Those considering a move to a golf community should look carefully at the course’s stability and ask for all relevant documents and data. The migration of baby boomers from North to South continues apace. And the recent Federal tax changes only serve to hasten the flight. South Carolina’s overall tax burden on individuals, for example, is under $3,000 annually. Connecticut’s, for example, is just under $8,000. Overall cost of living comparisons tilt even more strongly in favor of most southern towns. I purposely left my golf clubs in South Carolina after an early November visit there, mindful that I couldn’t use them up North for another four or five months. A few days before the new year, I checked the Weather Channel for an update on Pawleys Island and thought the predictions of snow and temperatures in the 20s were a typographical mistake. They weren’t, and we postponed our trip. A good thing because, as I write this, the Pawleys Plantation golf course is still closed, recovering from a week of snow and ice cover. It is a sad thing whenever a golfer cannot find a place to play within a two-hour plane ride. 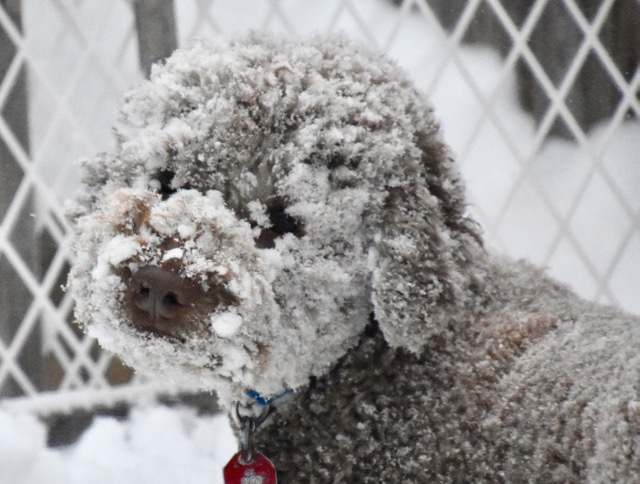 And some might look at the current spate of weather down South and wonder whether they should stop considering a winter or permanent home in the Carolinas, Georgia or Florida. Be that way if you want; but by the end of this week, temperatures in Pawleys Island will be in the mid-60s, and my neighbors there will be back on the golf course. 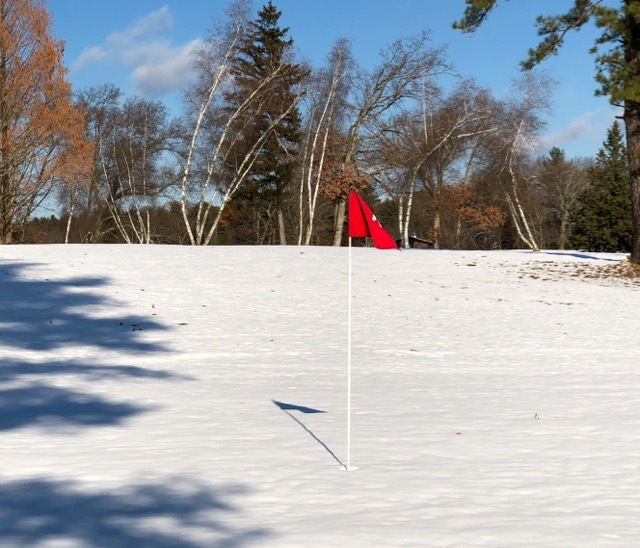 And me, I’ll be practicing my sand shots in a foot of remaining snow. I am not a big fan of “best of” rankings. They tend to be subjective and, in many cases there is a financial relationship (through marketing and advertising) between the reviewers and the reviewed. Sometimes, the reviewers don’t even visit the property. Our criteria for selection was simple: The community must have at least 36 holes of golf and be a place that I could see myself and my wife living. You can't get much more subjective than that. Boasting six golf courses, with layouts to suit every golfing temperament and ability, and virtually every social club and activity a retiree could imagine, The Landings is ready to take on residents of all stripes and interests. Savannah has a well-earned reputation for culture, sometimes to excess (read the celebrated Midnight in the Garden of Good and Evil), and Savannah College of Art and Design has remade the downtown area into an architectural paradise. Not that the city needed it; its 22 residential “squares” laid out centuries ago are as interesting as they are beautiful. Best of all, The Landings is less than 20 minutes from downtown Savannah. 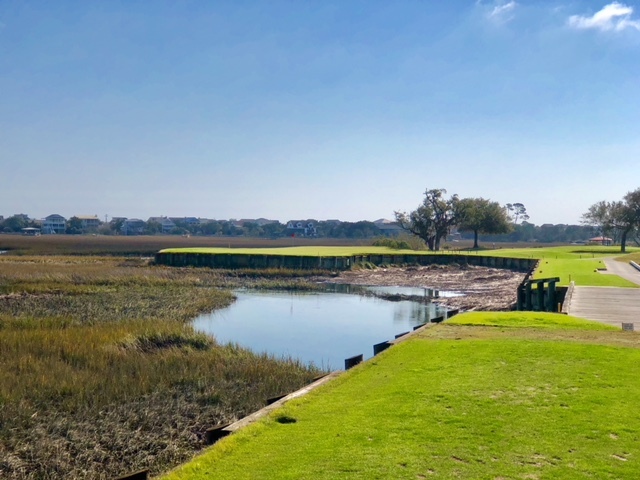 Kiawah Island, SC –- The extremely high quality of golf, fastidious conditions, two private and five resort courses, including Pete Dye’s vaunted Ocean Course, rated #1 every year by the South Carolina Golf Rating Panel, all make Kiawah a serious contender for best coastal golf community. The major elements in The Landings’ favor are its proximity to a city -– Kiawah is 45 minutes from Charleston –- and the transient flavor on Kiawah most of the year. Its golf courses and beautiful beaches are a magnet for vacationers, meaning any year-rounders will share the golf courses and beaches with ever-rotating groups of revelers. If you like your privacy, understand that Kiawah is a resort. Landfall, Wilmington, NC –- Like The Landings, an active downtown area is close by, just 10 minutes. Wrightsville Beach is just 10 minutes out the back gate, putting Landfall in the best position of any multi-golf course community on the east coast. The 45 holes of golf by Pete Dye and Jack Nicklaus (27) are a good reason not to wander off campus too often. The University of North Carolina operates a major branch in Wilmington that offers not only adult education opportunities but also big-time university athletics for those looking to “adopt” a team. Reynolds has so much going for it, including the stable ownership of Metropolitan Life Insurance Company, that retirees hell bent on living out their retirement near the ocean check out Reynolds anyway. And a fair number of them venture no farther. Whether it is the six impeccably maintained golf courses (with nameplates like Jones, Fazio, Nicklaus and the under-rated Jim Engh), one of the South’s cleanest lakes, the multiplicity of intra-community activities or the growing number of services just outside the gates that include a major supermarket, multiplex cinema and brand new hospital, Reynolds is a magnet for retirees seeking an active lifestyle far from the pollution and traffic of a less rural area. Yet for those who miss the urban connection, Atlanta is a not-unreasonable 90 minutes away. 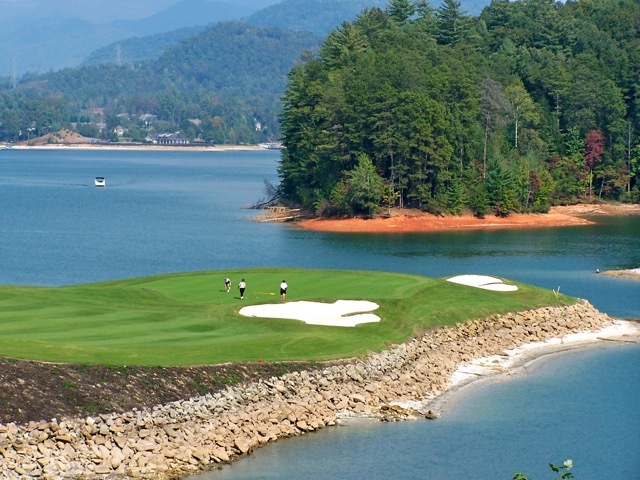 The Cliffs at Keowee Vineyard, SC –- The only reason The Cliffs does not finish in a flat-footed tie with Reynolds is that its seven terrific golf courses are spread throughout the upstate region of South Carolina and 10 miles south of Asheville in North Carolina. 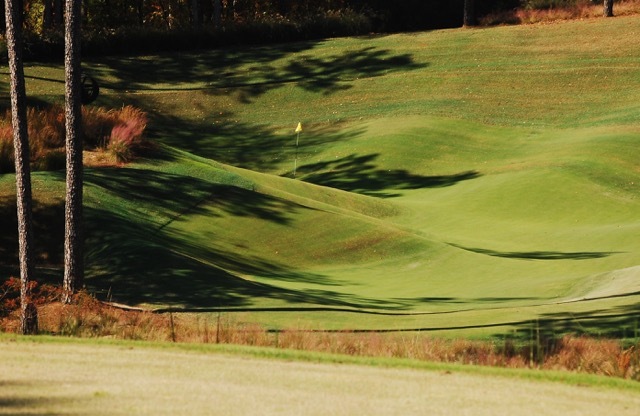 Their layouts are every bit as beautifully conditioned and fun to play as the Reynolds layouts, none more so than the Keowee Vineyard routing by Tom Fazio. (We are taking some liberty with our 36-hole rule because a second 18, under the Cliffs umbrella, is just a few miles away.) I annually rate the Vineyard course in the top 5 when my South Carolina Golf Panel ballot arrives because of its beautiful routing along the lake and the most eye-popping par 3 I have ever encountered (see photo below). But even though The Cliffs Keowee Falls layout is just minutes away, it is beyond the gates of a separate community, albeit under the Cliffs banner. One $50,000 membership provides full access to all Cliffs courses, a great deal if you have the available cash, but it is an hour drive from one end of the Cliffs chain to the other, making it a bit of a chore to take advantage of that relative bargain. 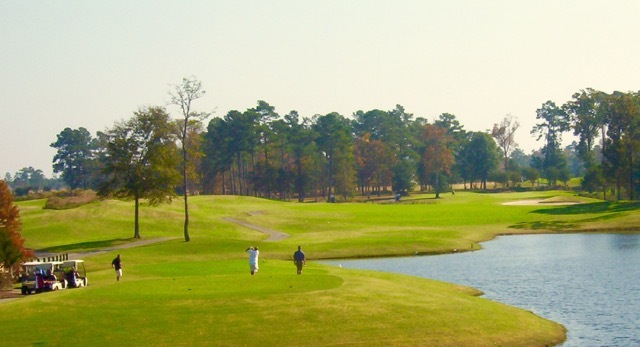 Savannah Lakes Village, McCormick, SC -- Savannah Lakes makes our list for one major reason that should appeal to any couple looking for a golf home –- an extremely low cost of living (and high value for what you get). Make no mistake about it, Savannah Lakes is rural, 35 minutes from the modest sized city of Greenwood and more than an hour from Greenville. But its two golf courses are well-maintained and lots of fun to play; better yet, they are entirely different, the Monticello course a more classic routing that uses Lake Thurmond as a backdrop, and the Tara course an up and down affair, with lots of dramatic changes in elevation. The homeowner association fee is almost laughably low at $1,300 annually, and it pays for access to everything, with a few modest surcharges assessed (e.g. $25 green fees per play, although frequent golfers can play all the want for $3,300 per year). The owners of Pinehurst are opportunists; as soon as an area golf course appears to be in some financial trouble, they swoop in to add the course to their already unbeatable portfolio. They are at nine courses and counting, and word is out that the golf courses at the very private Forest Creek community are for sale. Who knows? Even if Pinehurst never adds another layout, its membership deal is among the best anywhere, with residents living beside the courses able to secure access to most of them for around a $35,000 initiation fee and less than $500 in monthly dues; with certain plans, the most premium courses, like the heralded Donald Ross designed #2, are available to members as well as all those traveling golfers looking to absorb a bit of history. Pinehurst is a good hour from Raleigh, and the surrounding landscape is rather meh, but if you love golf, the landscapes of the golf courses are mecca. 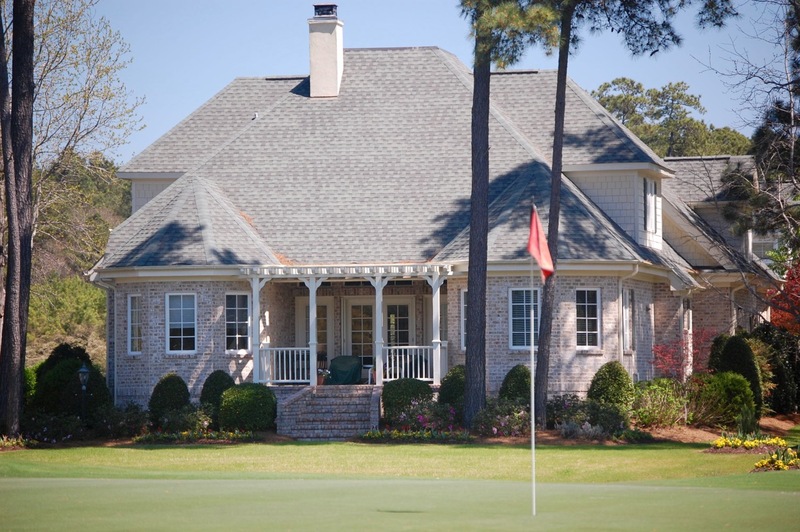 River Landing, Wallace, NC –- River Landing is the epitome of a golf community that doesn’t require highly experienced developers to produce a highly attractive environment. The product of a local family’s vision, and the more practical need to attract executives to work in the family’s huge livestock business, River Landing features two top-rated North Carolina layouts by Clyde Johnston. Conveniently sited less than one minute from Interstate 40 and a half hour from I-95, River Landing is about an afternoon’s ride from Philadelphia and not much more from the population areas of the northeast. And via I-40, you can be in Raleigh in an hour and Wrightsville Beach in 45 minutes. The tax plan that Congress is set to approve today or tomorrow will accelerate the already robust migration from North to South. Whereas in the last century, people moved in the other direction for job opportunities and to escape institutionalized discrimination, this latest migration will be all about economic security. Whether you are for or against the plan, one thing that is undeniable is that many residents of the so-called Blue states like New York and New Jersey will lose a higher percentage of their income to property and state taxes than they are currently losing. The new law caps at $10,000 the deduction for property taxes and state income taxes combined. Once you hit, say, the $10,000 mark in property taxes, you will get no deduction on your state income taxes. Those living in the South, who are already paying much lower property taxes than their counterparts in the North, will not be affected because rarely are taxes on homes in the Carolinas and Georgia, for example, taxed in excess of the $10,000 threshold baked in the bill. And our friends in the South generally pay lower state income taxes, if any at all (none in Florida, Alabama and, in some circumstances, Tennessee). Take comparable homes in, say, my hometown of Avon, CT, and Pawleys Island, SC, where I maintain a vacation condo. A $600,000 home currently listed for sale in Avon carries a property tax burden of $12,000. Owners of a home in Pawleys Plantation, just down the street from our condo and listed for sale at $599,900, paid just under $3,000 in property taxes last year. Now that may not appear overly consequential for the Avon homeowner, the difference between the $10,000 exclusion and the $12,000 in property tax. But what about the state income tax? The Connecticut homeowner will be on the hook for all of that because they will have used up the $10,000 exclusion on property taxes (or, if they used it up on the state income tax deduction, they will receive no deduction for their property taxes). Much of the migration to date is courtesy of baby boomers retiring to the Sunbelt for lifestyle and climate reasons, as well as to reduce their cost of living. The coming wave will be more mixed, with working individuals seeking new job opportunities and a less tax-burdened lifestyle, and baby boomers, whose 401K and IRA plans have been over the moon in recent years. They will continue to seek an active and warmer lifestyle and to preserve financial resources in their post-working years. Most readings of the tax bill show a huge advantage overall for the wealthiest individuals. But not so fast, especially for those persons with a high-balance mortgage on a $1 million or greater home. They no longer get to deduct interest on the mortgage amount over $750,000. But with a move to the South, they could surely find a $750,000 home every bit as deluxe as a $1.25 million home up North, keeping their mortgage, if they require one, within the boundaries of deductibility, according to the proposed law. All this could conspire to drive up the prices of real estate in the South, especially if developers are not quick to build plenty of new homes. The compulsion to do so is obvious. In that example of the two homes above, the $600,000 Avon home has 4,380 square feet and 4 bedrooms, 3 baths and 2 half baths. The price comes out to about $137 per square foot. The Pawleys Island home, which spans 6,200 square feet, features 6 bedrooms, 6 baths and 2 half baths and costs out at just $97 per square foot. You may very well not need that much space in your retirement, but that kind of “bargain” is more the rule than exception in many areas of the Sunbelt. At least it is for now. Weather on the golf courses this week in Pawleys Island, SC, reminds me of the climate changes during a June round of golf in St. Andrews. Back in 2009, I endured a little bit of everything on the Old Course; sunshine and 65 degrees on the first tee, dark clouds on the second and third holes, and sleet and heavy wind on the fourth hole before, almost as quickly, the skies and temperatures retreated to first hole conditions. Things don’t happen quite as precipitously on the coast of South Carolina, but over the course of four days in early December, I have seen just about the same conditions. I played in brilliant sunshine and temps in the mid 60s on Sunday, similar but more breezy conditions on Tuesday, and uniformly grey skies with imminent rain on Wednesday (but still low 60s temperatures and it only started to rain just as we finished in early afternoon). Today it is rainy and in the low 40s, and I am sitting it out. 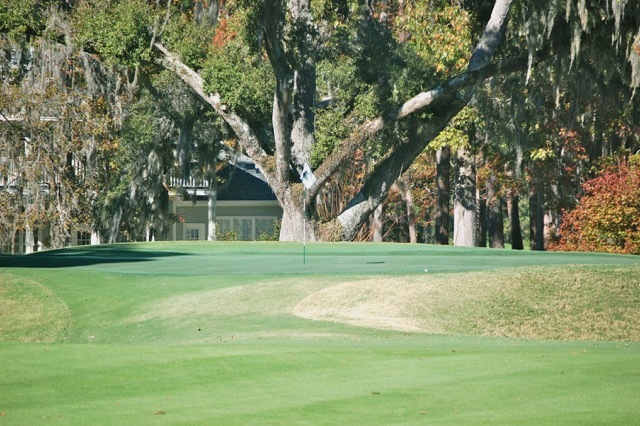 Pawleys Plantation signature hole, the 13th, with Pawleys Island beach homes beyond. For those contemplating a move to the South Carolina coast, don’t expect to play golf every day in December — or January and February, for that matter. Recalling Christmas week vacations in Pawleys Island with the family for many years, the chances of playing golf in a heavy sweater or ski jacket were as good as playing in shorts and a golf shirt. One year it snowed, just an inch or two but enough to keep almost all the locals off the road, giving the veteran northerners a chance to get into the most popular restaurants in the area without a reservation. Of course, for those dedicated linksters who play through the winter in New England, 44 degrees and a little drizzle will do quite nicely in December. I return to CT on Saturday and they are expecting snow; 44 and rain starts to look a little better. Brad Chambers, who publishes ShootingYourAge.com, joined me this week for rounds at both Pawleys Plantation and Caledonia Golf & Fish Club, located about three miles from each other in Pawleys Island. Although Pawleys Plantation features a great layout and, frankly, is the most challenging course on the Grand Strand, in my humble opinion, the club apparently had a litte trouble with grass growth on the greens earlier this fall. They are coming back, but Brad and I agreed that rarely had we putted greens before where reading the grain was absolutely fundamental to getting any putts close to the hole. That wasn’t a problem the next day at Caledonia where the greens were, as always, fast and firm without any grain to speak of. Caledonia is a tough course to play the first time, given that many of the forced carry approaches demand drives on the proper side of the fairways. But after a round or two, the best pathways to Mike Strantz’ enormous and wavy greens — some look like green tsunamis — become more obvious and a good score is possible. As always, the folks at Caledonia, from the bag drop to the pro shop to the friendly wait staff in the don’t-miss restaurant, took exceptional care of us. It is small wonder that Caledonia is typically ranked as the best golf experience of the 100+ golf courses on the Grand Strand. 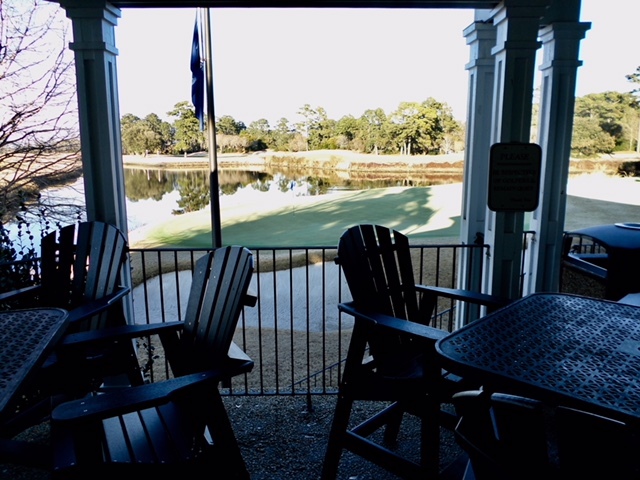 As mentioned above, the dining room at Caledonia Golf & Fish Club is not to be missed by anyone visiting the Pawleys Island area. For those who believe “you can’t eat atmosphere,” Caledonia may change your mind. A seat on the back porch, for example, where there are about a half dozen tables, looks out to miles of marshland, turned a golden color at this time of the year and a beautiful shade of green during the warmer weather. I had told Brad of the sight of boats on the Waccamaw River about a mile in the distance and, sure enough, as if on cue, one did just that, its white mast poking above the top of the field of gold. It’s only lunch, but the Caledonia kitchen behaves as if it is cooking for royalty, lavishing so much care on what is normally a simple, greasy patty melt sandwich that I found myself smacking my lips. And yet as good as my sandwich was, I looked longingly at Brad’s club sandwich for which one whole turkey breast must have been sacrificed. By the way, if you are given a choice of sides the first time you have lunch at Caledonia, opt for the house made potato chips; Brad ordered the french fries, also terrific, and I let him try one of my potato chips — but just one. The acknowledged best restaurant in Pawleys Island is Frank’s, and I didn’t want Brad, who lives four hours away from Pawleys, to miss out on a meal there. He wasn’t disappointed, and I certainly wasn’t either. The “Duck Two Ways” I had was the best preparation of duck I have had either way in decades, the confit moist and perfectly seasoned but not tasting of any of the fat it was cooked in, the breast exquisitely cooked into medium rare disks both firm and soft, as difficult to prepare and crazy good as that sounds. Many year’s ago at a conference in New York, I sat next to a professor from the University of South Carolina. When she learned I vacationed in Pawleys Island, she said she and a colleague drove the four hours roundtrip to/from Pawleys a few times a year to eat at a special restaurant there. “Don’t tell me,” I said. “Frank’s, right?” In dining as well as golf, long drives are rewarded. The porch off the Caledonia restaurant almost hangs over the 18th green. I don’t know where to go for data on supermarkets per capita, but if I did find a source, I feel confident that Pawleys Island might have the most per capita in the nation. If you like to cook, there may be no better place to live and play golf. Take, for example, Pawleys Plantation, where I own a vacation condo. Less than one mile from our gate is a large Loews supermarket. Across the street from Loews is a Food Lion, and less than a mile north of Food Lion is a gigantic Publix supermarket, just a few years old. For those who favor more gourmet provisions, Fresh Market, a competitor of Whole Foods, is another 1 1/2 miles up Highway 17. That amounts to four supermarkets within about three miles of Pawleys Plantation. Of course, on the coast, you should have access to fresh seafood. During the spring and fall, local fishermen set up their refrigerated trucks in a few parking lots on Highway 17 and sell freshly netted shrimp at discount prices. They don’t operate in December, but this morning I drove just eight miles to the docks along the inlet in Georgetown and picked up a pound of humongous shrimp for just $8.99. The town fathers don’t tout Pawleys Island as a foodie destination, but they probably should. Mark Saunders, head of Coastal Communities in North Carolina, has managed to make headlines about golf communities he has built between Myrtle Beach and Wilmington, including Rivers Edge and Ocean Ridge Plantation. Some of those headlines involve claims filed against him by property owners in his developments. In the most recent, filed in Brunswick County Superior Court, Coastal Communities was the plaintiff and emerged with a favorable judgment when the court ruled that property owners in Ocean Ridge, not Coastal, were responsible for tax assessments after Saunders turned over the community’s governance to the residents. It seems that the tax bills kept going to Coastal for a few years and the company kept paying them, despite original covenants indicating responsibility for the taxes belonged to the property owners after turnover. In the wake of the judgment, the two sides are expected to engage an arbitrator to help decide on just how much, and on what schedule, Coastal Communities should be repaid. Read here. This is a good reminder for those considering a golf community home to read the written covenants that govern details of the turnover of the community from developer to residents –- not only on what schedule the property owner’s association takes responsibility for paying fees but also about who will have control of the golf club after the developer leaves. In some cases, the developer retains control; in other cases the property owners have the right of first refusal to purchase the club and, in still other cases, the agreement is that property owners will take over ownership of the club, either for a price stipulated in the covenants or for no cost at all. It would be a good idea to know what financial commitments are in your future. As we said above, Mark Saunders has been involved in lawsuits before, but what is of particular interest is the rather unusual way in which he and Coastal Communities have chosen to defend themselves. They created a web site and blog to post articles about their side of the story and to testify to how seriously they take the legal actions. The title of the site, “Mark Saunders Lawsuit,” serves mostly as a reminder to people that the words “Saunders” and “Lawsuit” go together. Plus, there is no content on the site, other than a few sentences on the home page that assures that “The unfounded Mark Saunders lawsuit stories should not be of concern” and “there has been exaggerated news of a Mark Saunders lawsuit in the past…” The evidence offered for these assurances is that “Mark Saunders takes lawsuits very seriously and it shows in the careful and detailed work of The Coastal Companies” and that Saunders has done a great job of developing local communities. It is hard to figure out how bringing attention to the lawsuit without any attempt at arguing the merits of their case is a smart play…not to mention how a court weighing evidence might look on a defendant or plaintiff arguing the case so publicly, if insipiently. This is all kind of sad because Ocean Ridge Plantation in Sunset Beach, NC, is a nicely conceived, multiple-golf-course community whose major misstep, it appears, was to promise a new section, called Jaguar’s Lair that, after 10 years –- and a few angry lot owners –- still does not have a basic complement of roads, electricity lines and other basics required to build a home there. Despite the fact that Jaguar’s Lair properties were opened just in time for the Great Recession and the collapse of the planned development housing market, the relative few property owners have suffered with rapidly depreciating assets, although the rest of Ocean Ridge seems in good shape. In August, according to television station WWAY in Wilmington, the town of Sunset Beach and Coastal Communities reached an agreement to deliver utilities and roads in the next couple of years. I take a measure of satisfaction and pride that this web site is focused on baby boomers who play golf, or just want to live in a community that is nicely landscaped, with plenty of green areas, and is likely to help appreciate the real estate it contains. (I take just as much pride when a 40-something contacts me for assistance in finding a vacation home in a golf community.) Most golf web sites appeal to golfers of all ages, and it is cause for celebration among us 60-somethings when one debuts that is singularly focused on us. Enter ShootingYourAge.com, the brainchild of Brad Chambers. 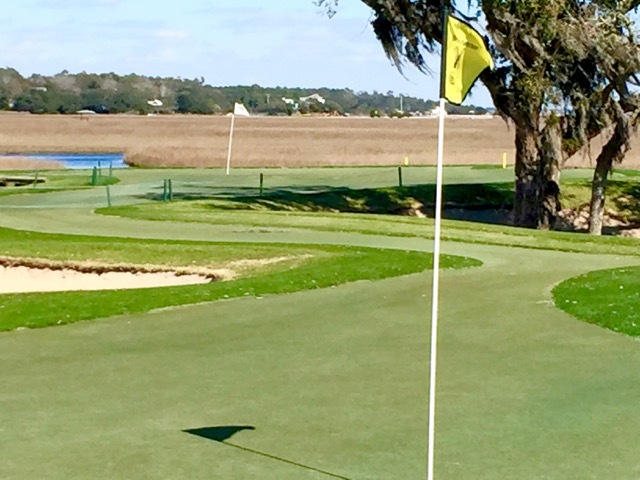 Brad and I will be meeting for a couple of rounds of golf in Pawleys Island, SC, the first week in December to share experiences and ideas, and most of all to discuss how we might work together to enhance the flow of information to baby boomers who love golf as much as we do. Brad’s mission is to help us all “golf better” as we “grow older.” His background is uniquely appropriate to his new enterprise, beyond just being a baby boomer who plays golf. For the better part of three decades, Brad has trained business and non-profit employees in the art of leadership. As a dedicated golfer, he began to see an interesting nexus between the game we all love and leadership principles. Here is how he puts it: “Golf, more than any other sport, exhibits, showcases, and sometimes rejects those displaying -- or not -- leadership principles. Your ball moved in the woods? Only you know. Integrity is on display at all times.” Brad calls this flouting of the rules on the golf course an example of “Cowardly Leadership” which is also the name of a book he has published. For those who have read this far, currently subscribe to Home On The Course (or subscribe in the next two days), and live in or will be visiting the Pawleys Island, SC, area on December 5, send me an email if you would like to join Brad and me for our round of golf at Pawleys Plantation, a fine Jack Nicklaus layout about a half hour south of Myrtle Beach. I will be pleased to host the first two who sign up. I can promise there will be a lot of talk about living in a golf community, reviews of golf courses around the world, and how to be a good leader on and off the course. You might even learn how to shoot your age. The greens at the par four 16th (foreground) and par 3 13th at Pawleys Plantation are backed by the marsh that separates the golf community from the Pawleys Island beach. The Wall Street Journal, in a special retiree-oriented section published today (11/13) called “Encore,” lays out nine questions couples looking to retire to the Sun Belt should ask themselves. (Click here, but you may have to be a subscriber in order to read the full article.) They range from the provocative to the obvious, but all are worthy of consideration before moving. The most obvious question, yet one that is often overlooked by retired couples, is “What do you want to do?” after you move. At least one spouse, and in many cases both among those couples I work with, indicate some of their days will be filled with golf. Those who opt for golf communities featuring multiple courses won’t get bored quickly but, even for the golf-obsessed, most of their hours will be spent in other pursuits. That is why one of the most fundamental questions to wrestle with is whether to live near a city of some size or in a rural setting. An urban or suburban location will provide the customary attractions of good restaurants, movie theaters, perhaps a major university (or at least a nice-sized college) and all the cultural activities attached to them, plus the most important factor for those with health concerns, a good hospital and an array of well-rated doctors. And those for whom travel will be a key part of retirement will also find great comfort in a near-urban area with an airport within 45 minutes to an hour away. 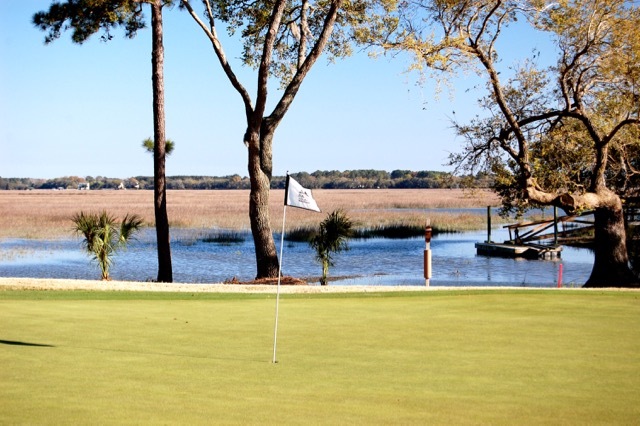 Although it is only 20 minutes from Beaufort, Dataw Island and its marsh-adjacent golf holes can feel many more miles away. Many couples don’t have health concerns at this point in their lives, but they do have an aversion to the burdens of population density, such as traffic, noise and air pollution and the general hustle and bustle that very likely characterized their working and family-raising years. For them, trips to the city for a show or other special event will be an infrequent venture, especially if the community they choose offers plenty of other activities on site to go along with an active golf scene. A few boxes can be checked in either type of location. If, for example, a major force in a couple’s lifestyle is to volunteer for church or civic organizations, the need for community support is substantial in both rural and suburban/urban locations. Intra-community clubs are just as available in large rural golf communities as they are in communities closer to a city. You may not have the variety of supermarkets in a rural setting, but I don’t know of any sizable communities that are farther away from a viable supermarket than 10 miles (and traffic to and fro will be a breeze). My advice is to always decide first on topography -– mountains, lake/inland, or coast –- as a destination and, once that type of destination is agreeable to both spouses, then decide whether to be near a city or far from the maddening crowds. In short, urban vs rural is a pretty obvious discussion couples should have before starting a serious search for a golf community. Doing so will save a lot of wasted effort when it comes time to plan itineraries and make visits to golf communities under consideration. Six golf courses immaculately maintained and a sprawling community –- 4,800 acres -- surrounded by marshland. Perhaps the biggest attraction is The Landings’ proximity to downtown Savannah, just a 20-minute ride away. Ideally wedged between the city and the ocean, both are no more than 10 minutes from Landfall’s gates. The 45 holes of Jack Nicklaus and Pete Dye golf are about as good as it gets inside the gates of most golf communities. Wilmington’s airport is not huge, but it does host such airlines as American and Delta and provides non-stop service to the major hubs at LaGuardia in New York, Atlanta and Charlotte. Chapel Hill certainly is not a big city, but when you combine Governors Club’s proximity to the local University of North Carolina and Durham’s Duke University less than 15 minutes away, you can’t get a more vibrant and entertaining atmosphere. In short, the Chapel Hill area plays like a big city, with great concerts and museums, college sports, restaurants and shopping. Governors Club’s 27 holes of fine Nicklaus golf are entertaining as well. 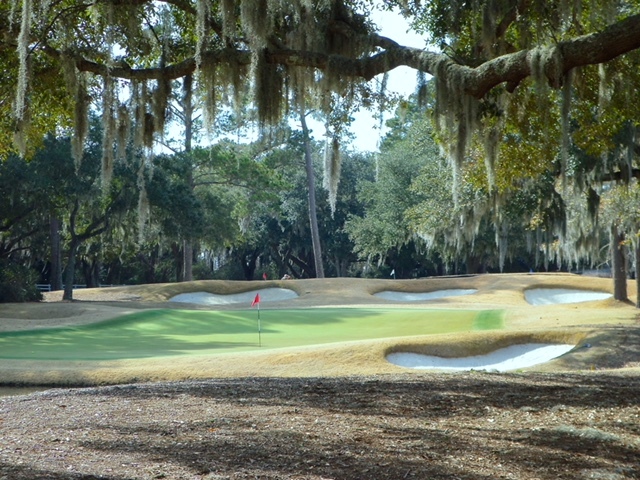 Savannah Lakes could very well be the best bargain in golf community living anywhere, with a number of nice homes priced below $100 per square foot and a property tax rate to match. 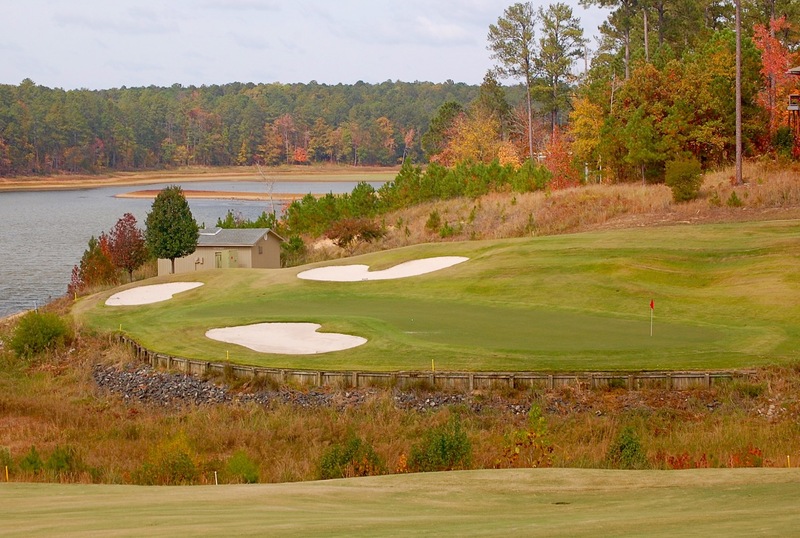 The two terrific golf courses are totally different in character, and the location on Lake Thurmond provides residents with plenty of water-oriented activities. The community is home to enough residents to provide good reason to stay on site, but on those days you get the itch to travel, the college town of Greenwood is just a half hour away. Not exactly rural in that the charming southern city of Beaufort is 20 minutes away, but the three-mile long drive into the community through live oaks and over marshland sure makes Dataw feel “out there.” The two top-notch golf courses by Tom Fazio and Arthur Hills provide plenty of reason to stay on site, but Dataw residents will never feel isolated, given the excellent restaurants and boutique shopping in Beaufort and the pristine beach at Hunting Island State Park, less than a half hour away. 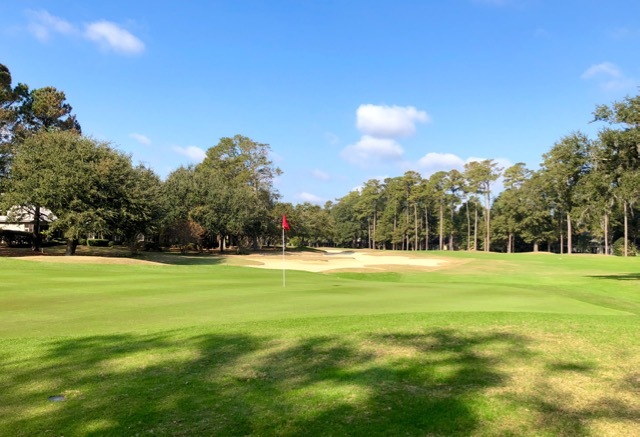 Sapelo Hammock may be just an hour south of Savannah and only nine miles from Interstate 95 but you will be hard pressed to find a quieter, more out of the way place for a coastal golfing lifestyle. Shellman Bluff is a quiet fishing village within walking distance of the golf club house and surrounding homes. Shellman Bluff’s tiny fleet of fishing boats still troll the local ocean waters, and return with literally the catch of the day. The golf is rustic, meaning it is links like and wind blown and its clubhouse is intimate, but members and guests alike buy in to the live and let live vibe that any small town in the middle of a quiet and beautiful nowhere should promote. We are ending an awful hurricane season, a fact that might put some people off their dream of a home near the beach. My wife and I own a vacation home less than ¾ mile from the Atlantic Ocean in South Carolina and, yet, I believe the odds are with us in terms of hurricane damage. See what I mean in the latest issue of Home On The Course. I tackle a few other topics, but maybe the most compelling information in this issue of Home On The Course is a chart I put together that shows sample home prices and the property taxes paid on them. Those of us who live in the high-tax Northeast should be especially interested in all the 3,000+ square foot homes in nice golf communities that carry property tax assessments 1/5th to 1/10th what we currently pay. 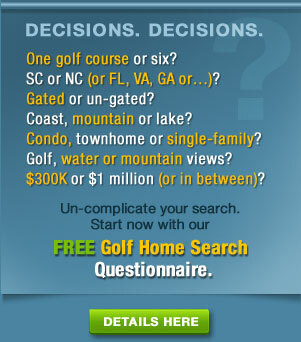 How about a $300,000 home in a fine Carolina golf community with annual property taxes below $1,000? Crazy but true. You won’t want to miss this issue of Home On The Course. Subscribe for free today. A Golf Home in Hartford, CT? Seriously? Seriously.